Over the weekend, Chance the Rapper celebrated his 26th birthday at TAO Chicago Nightclub, along with his newly pregnant wife Kirsten Corley and 30 of their closest friends. The group arrived just after midnight and took over an entire VIP area, taking in sounds courtesy of Chance’s own DJ Oreo, who played a surprise set for over an hour as part of the festivities. Chance was in great spirits and really seemed to be letting loose and enjoying himself as he and Kirsten danced and enjoyed the party. Chance’s guests enjoyed Belvedere and Don Julio Reposado cocktails. 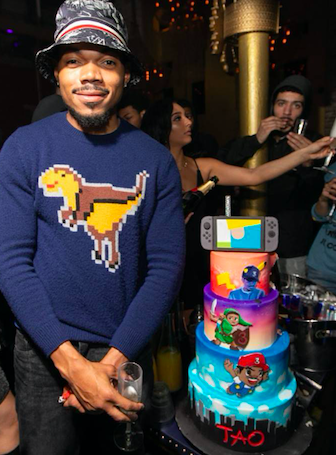 At the peak of the birthday party, a Nintendo Switch-themed three tier cake, and a bottle parade of Moet & Chandon champagne, along with Don Julio 1942 made its way to Chance and his fellow guests. The entire nightclub erupted in cheers as the DJ led the crowd in wishing Chance a very happy birthday. Chance had a blast with the playful cake, posing for several photos, even pretending to play with the controller on top. Also in attendance at TAO Chicago Nightclub was Chicago Bears star, Khalil Mack, who had a blast hanging with friends and drinking Don Julio 1942 and Moet Champagne. As he and his guests were seated at the table across from Chance the Rapper, the two greeted one another and chatted as Khalil wished Chance a happy birthday.